Suggested Usage: Take 2 softgels 1 to 3 times daily with food. The above information was taken from Sears Institute for Anti-Aging Medicine, 11905 Southern Blvd., Suite 102, Royal Palm Beach, FL 33411. 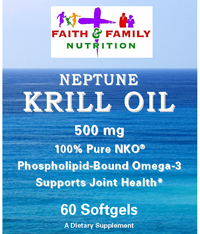 Neptune Krill Oil is manufactured under strict quality control standards. It is tested to be free of potentially harmful levels of contaminants (i.e. mercury, heavy metals, PCB’s, dioxins, and other contaminants). NKO® is a registered trademark of Neptune Technologies & Bioressources Inc. Quebec, Canada. US Patent No. : 8,278,351.